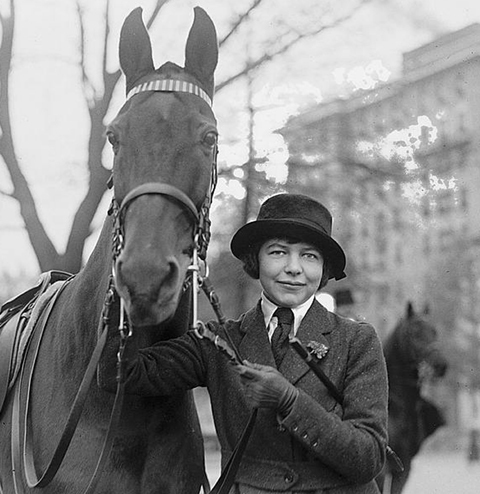 Washington circa 1920s. "Mrs. Gaillard." From a Harris & Ewing portrait series depicting society types in historical and theatrical costumes. View full size. Submitted by willc on Tue, 04/03/2012 - 4:10am. 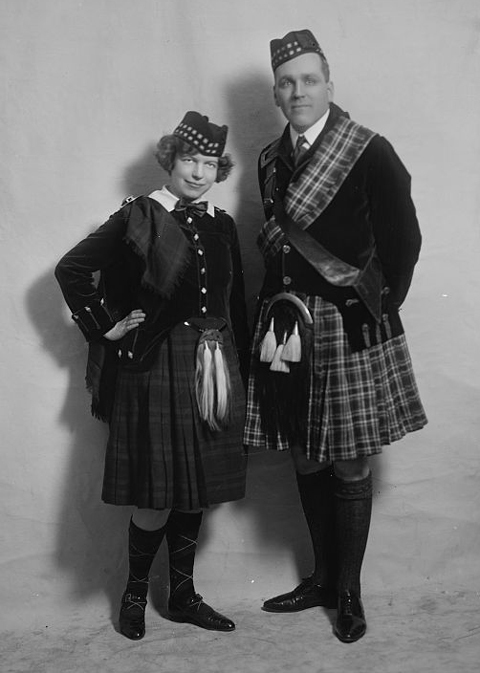 It appears from their few surviving LOC photos that the Gaillards enjoyed fancy dress parties or events. Here's another portrait of them from the early 1920s, with no makeup malfunctions. Another, very damaged negative recorded their appearance in Revolutionary War costumes. Submitted by rgibsonx2 on Mon, 04/02/2012 - 4:21pm. Her husband, Col. David St. Pierre Gaillard, died in 1982 at the age of 92. Mona passed in 1990, three months shy of her 90th birthday. They lost a son, David St. Pierre Gaillard, Jr. in 1951 (Korean War?). Submitted by tterrace on Mon, 04/02/2012 - 2:30pm. Like it says in the caption. 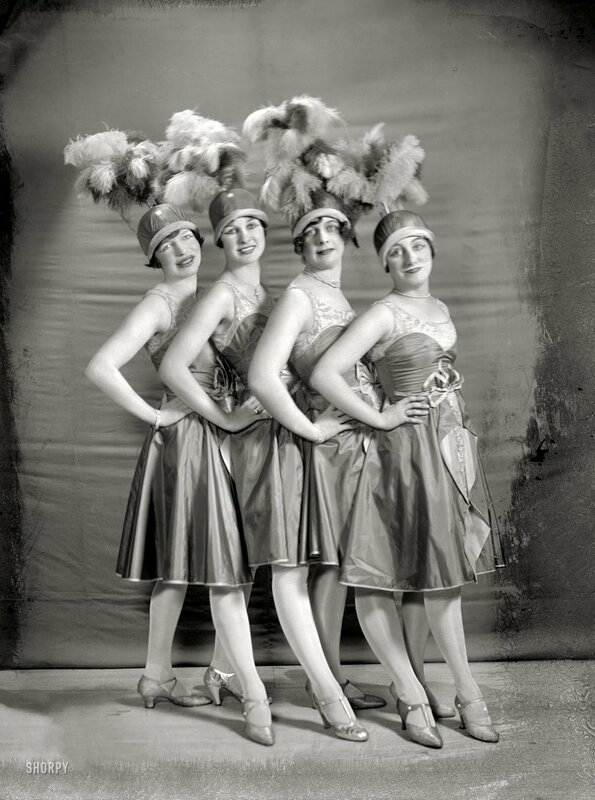 They're deliberately dressed and made up outlandishly - in this case, like showgirls of a somewhat earlier era. Imagine if 92 years hence someone saw you in a photo made up for a Halloween party and thought, "My God! Did people really go around like that then?!?!" Submitted by Pudgyv on Mon, 04/02/2012 - 12:20pm. You can't judge the past by the standard of today. Yes, their makeup look strange to us. Look beneath it. Those ladies are lovely. I mean, as in, Hubba-hubba! Submitted by Vintagetvs on Mon, 04/02/2012 - 12:03pm. The Focus is rather soft on this one, not nearly soft enough to help however. Submitted by willc on Mon, 04/02/2012 - 11:08am. The first chorine on the left appears to be Mona Blodgett Gaillard (b. 1900), who married Capt. David St. Pierre Gaillard in Washington on November 7, 1921. This suggests that the photo's date is a little later, unless one of the older ladies on the right is her mother-in-law Katherine David Gaillard (1866-1937), widow of Lt. Colonel David DuBose Gaillard (1859-1913), director of engineering on the Culebra Cut in the Panama Canal. The LOC has two 1919 photos of Miss Blodgett, then a Washington debutante. As a wedding gift, her mother, Mrs. Delos Blodgett (Daisy), a wealthy Washington widow, built her "The Rocks," in the upscale suburb of Crestwood. Get Max Factor here fast! Submitted by OTY on Mon, 04/02/2012 - 10:51am. Not exactly "dream girls", this quartet of grotesque gargoyles, unless you dream of close-ups of bizarre clowns coming at you. In the l930's and 40's, the major "make up" artist in Hollywood was Max Factor who enhanced the beauty of all the big stars of the day. He even had his own "Max Factor" museum which has since been included in the "Hollywood Museum" and I believe his former line of retail cosmetics is no longer sold. Submitted by History Lover on Mon, 04/02/2012 - 9:23am. It's too bad that these young ladies only have this 92 yr. old photo to show the world what they looked like in their youth. A bad combination of too much makeup, blurry focus, and mold on the glass plate doesn't do them any favors! Bet they looked considerably nicer with simple makeup and a better portrait. Submitted by Dutch on Mon, 04/02/2012 - 7:56am. The first thing that came to mind was Tony Curtis and Jack Lemmon dressed as women in Some Like It Hot. Hope that's not too cruel. Submitted by TheGeezer on Mon, 04/02/2012 - 7:47am. As always, with shots like these from that era, I see Tony Curtis (as in Some like It Hot). And I hope someone showed the little redhead on the left how to avoid her nose with a lipstick!